Ryan Turner and his team are keeping a scientific eye on water in the Reef catchment, constantly improving methods to monitor and measure pollutants. Introduction: The Great Barrier Reef needs to be fighting fit to cope with climate change. While the world takes action to address climate change, improving water quality is the best thing we can do to increase the Reef’s resilience. Runoff from the neighbouring catchment can cause all sorts of problems when pollutants end up in delicately balanced reef ecosystems. In this podcast series we talk to farmers, scientists, extension officers and local experts to hear their water quality perspectives. 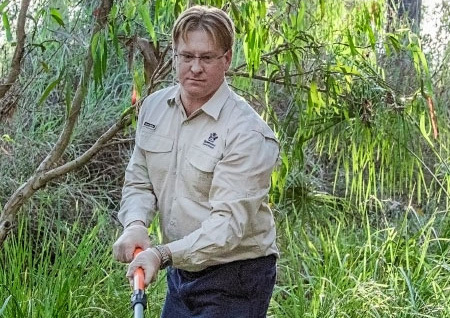 Ryan Turner: My name is Dr Ryan Turner and I'm the principal scientist for water quality investigations and we coordinate and manage the water quality monitoring in catchments rivers, creeks and streams for the Paddock to Reef program. My background, I started with a private company doing some consulting in the water space and soil space and then I found a job with the Queensland Government running their waters laboratory. I started back in 2006 doing analysis for the Paddock to Reef program and then in 2009 I became the Program Leader for the water quality monitoring program. Vanessa: Do you find this work rewarding? Ryan: Yeah my passion has always been to ensure water quality, water is for industry it's for life it's for agriculture we need water to live to ensure the quality of water is to ensure the future for us. So that's my passion, to make sure we have the best water in Australia. Vanessa: Can you talk about the context of the work you do and how that relates to water quality in the Reef lagoon? Ryan: Yes. So the team and I we manage a program which monitors rivers, creeks and streams that export to the Great Barrier Reef lagoon monitoring and points in the river. We don't point the finger at anybody. Anybody above that point the river is contributing pollutants to that river. But what it is it's a good point of truth. It's a lot of data actual data actual samples that are taken out of creeks and rivers and streams and we can present that data to landholders to industry, to universities agencies and it gives some foundational data for the status of our streams and rivers and then that data is then used to underpin and support source catchment modelling which is part of the Paddock to Reef program. But our data is also used for many other things. It's used for regional report cards just to tell the status of those catchments. The current state of the water quality. It's been used by the UN in the OECD reports. It's been used by the Bureau of Meteorology for modelling e-reefs. So it's heavily utilised and it becomes a bit of a foundational data set, a point of truth where people can make decisions or they can look at areas where there might be investment or improvements required to improve water quality. Vanessa: If I went to one of those locations where the monitoring is happening what would I see? Ryan: Yes, some of our locations are manual. It's the old classic bottle on a pole. We're dipping into water at a point in time and we do a bit of recording. Then our state of the art is a double-walled cyclone proof shed, has solar panels, batteries has a lot of scientific equipment in it and we have things called Auto Samplers which is basically like a fancy Waeco fridge. Some people have a Waeco fridge in the back of their utes and we have them in the sheds. We have some probes that are like I guess a cylinder that we stick into the water and we have little devices that measure the different parameters or the different types of pollutants we find in the water and then all of those bits of equipment are connected to the Internet and we see all that data in real time. And then what happens is the actual physical samples that are collected by those fancy Waeco fridges, those auto samplers, people go there and they collect them, process them and we send them to laboratories, which are NATA accredited for Australia and we then get data back and we can use both the probe data that's in situ in those rivers and the lab data to then do some of our calculations and help support Reef Plan. Vanessa: What are the main things you're looking for in the water? Ryan: Primarily we're looking for sediment so that's how dirty the water is. We call it total suspended solids and we're looking for phosphorus and nitrogen which are nutrients and we look at the various breakdown of those compounds and we also look for things called pesticides and so they are things like fungicides, herbicides or insecticides that are used in the catchments. Vanessa: Can you tell us how those substances get into the river? Ryan: All of those substances besides pesticides are both naturally occurring and also what we call anthropogenic or human introduced so they are applied on the land for various reasons either as fertiliser or as a chemical to do something that control weed generally the most common way is through rainfall and runoff but there's lots of other mechanisms that get them into the waterways. But that's the most common way. Vanessa: You have a lot of opportunities to meet people throughout Queensland and talk to them about these issues. Can you share your experiences talking to people about water quality? Ryan: I guess when I started to do shed meetings or town meetings or town hall meetings there was a lot of reluctance to acknowledge that there might be an issue. Since 2009 and it's a credit to the industry, it's a credit to growers themselves, that they've really come on board they see that they are part of the issue and they're also a part of the solution. So there's been a journey. I would say there's some regions that are much further ahead in the Reef Plan world, in making sure that they're really good stewards and they know what their footprint is in the catchment and there's some other regions that probably have a way to go. But I think the most encouraging thing is Reef Plan and Paddock to Reef is an opportunity for everybody to get around the table. It's the grower, the politician, the scientist, the universities, the industry bodies, everybody is allowed to get around the table and look at the data and have comment and steer us in the right direction. I don't think there's anybody that doesn't want to look after the Reef. And sometimes it just takes a bit of information, a bit of data to bring somebody that's doing something on the land to realise that they actually have an impact. Everything we do in a catchment whether it be growing your own personal roses to producing something like cane or grains, everything has a footprint. And all we're trying to do is get people to have the smallest pollutant footprint that we can through best management practice to minimise those constituents going into the waterways and therefore improving water quality and therefore helping the resilience of the reef for the future. Vanessa: When you go to those shed meetings what are some of the comments that you hear that reflect scepticism? Ryan: Yes. The classic one I always hear is ‘oh that all comes out of the rainforest’ and that is true there is nitrogen and phosphorus and sediment coming out rainforest. Australia's an eroded country, it's an old country. So we have sediment generation we have these beautiful sand islands off our coast because of that. But what is very evident and it's evident in our data let alone the modelling let alone the Scientific Consensus Statement is the significant increases of those naturally occurring compounds nitrogen phosphorus and sediment coming out and that is because we have modified our land. Vanessa: Ryan we've heard a lot of farmers talk about the issue of modelling and concerns about how that's done. What do you say to farmers when you meet them about to reassure them about the way modelling works? Ryan: Yeah. So modelling has its place. It's important. It allows us to forecast hind cast. It allows us to assess where we might invest. Modelling is underpinned by monitoring and the monitoring has got some foundational data sets. But the interesting thing is it's sort of like a relationship. You can't just have modelling and you can't just have monitoring. Where we do monitor and where the models also predict, they're quite close. They're quite accurate. It's really encouraging that there's multiple lines of evidence not just from our data but with other types of monitoring, from other sources of information, that are also backing up what the models are saying. Yes the models can always improve and that's what they do every five years we enhance the models we get more data more understanding we improve them we get better resolution but if we didn't have models I guarantee you we wouldn't be able to be as far ahead of trying to resolve this issue of improving water quality because we'd only have tiny little snapshots in the state. So modelling is important and it's as important as monitoring. You need both. And for anybody to say you need one or the other I truly disagree. You need to have both. And the encouraging thing is they work well together. Vanessa: How do we help growers who want to know what's happening in their paddock? That want hard evidence from their own local area. Ryan: I guess the couple of things I can do the easiest would be to do their own local water quality monitoring program. The benefit of that is they'll get some instantaneous data so they could use probes and simple turbidity or conductivity probes they can use dip sticks to look at how much nitrogen is in their water. They can get fancier and get more complicated then use some high tech gear or they can run programs like Project 25 or Sandy Creek project or the Herbert water quality monitoring program where they use laboratory based analysis so it's a smaller final resolution scale of our bigger program. I mean we hope we can help them train and give them standard operating procedures. That's probably the most robust way to do it. But the cool thing if they do go down that path is then there's a data set that they can then supply to the modellers and that dataset can help the models tune for their catchment for their specific unique topography, climatology, their soil types; and with that the models can be more in tune for their region and then they can forecast hindcast and look at different scenarios and they can be part of the Paddock to Reef story. Vanessa: Can you share some examples of projects that are happening now where you've really seen change or improvements. Ryan: Yes so a couple that have been official projects like the Sandy Creek program. So for a few years I was going given shed meetings and then on I think was a late afternoon for I was about to jump on a plane 12 farmers said ‘Oh we've had enough. We're tired of the bad news story. We want to get and find out where these issues are’. So these 12 farmers took it upon themselves with some support from Queensland government in our program to sample and to see where the hotspots in their catchments were. And that's been encouraging because some farmers now on their own initiative have implemented some changes because they realised that they might not have been the worst case scenario in their catchment but they did actually have an impact, they did have a footprint and so they installed sediment traps some farmers have stopped using chemicals because they moved too quickly and get off their catchment and into the waterways and they've chosen more environmentally friendly chemicals. So that's one example. I've seen simple stories where Tully Sugar have been very proactive when they saw some of our data from our program on a chemical called Imidacloprid they realised that this was going to be a problem and they took it upon themselves as an industry body to promote better use of this chemical and in that region in the Tully region we haven't seen a major spike in that chemical. So that's a promising outcome where the data’s informed some proactive management change. There’s quite a lot out there. Vanessa: The challenge of sharing science about water quality is a good microcosm for the broader challenge of sharing science with the public. Do you have any insights about the ways as a scientist we can do a better job of explaining complex scientific issues. Ryan: Yeah it's a very difficult question to answer. I'm not very good at it myself. Scientists are awesome at detail fine detail being precise been accurate but the people in the industry and the growers and the general public they need the science condensed in a format that engages them and gets them on board. And once you've done that then they will go and find that detail. It's a hard thing for a scientist not to put all the facts and figures out in front because you want to defend your position. But as long as you've got those facts and figures and that detail and you put a message that can engage your audience that can get them on the journey that you need and you want them to be a part of, then you can talk about the detail. So I think sometimes we complicate things too much, because it's a complicated story. It's a very complicated story. But you will lose people too quickly. Sometimes to tell a simplified message is more powerful than losing somebody because you've just put a thousand bits of data and a thousand diagrams in front of them. So yeah I sometimes think us scientists aren't the best communicators and we could all learn how to condense what we have and to convey it in that in a way to engage. And once you get that engagement growers especially they’re innovative people they are in their own right scientists of the land. They're tweaking this tractor and this boom rig and looking at different chemicals to use to manage a situation. They get it but we need to get on that journey and sometimes we go in with the wrong approach. Vanessa: What are the big priorities for your team in the next few years? Ryan: Big priorities is to make our data more available so where we were lucky enough to get a massive expansion. So we've doubled our size in our number of monitoring sites which is awesome for everybody. There's more data available to make better decisions. I'm a true believer that unless you monitor and evaluate you can't manage and we're trying to manage a very complex natural resource and we need the data to manage that so getting our data out because it's not just going to be Paddock to Reef that will help make these changes. It'll be industry, it will be the private sector. And so if we make our data more accessible I'm hoping there'll be a groundswell of students, of universities, of industries to start using that and coming up with some out of the box and lateral thinking ideas to help build the resilience of the Reef and improve water quality.